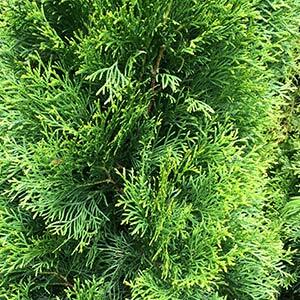 Thuja occidentalis, are one of the most popular species and cultivars, also known as American Arborvitae. Evergreen and great screening plants growing to 3m depending on species and conditions. Best divided into three groups, the low growing varieties, medium and taller types. Thuga occidentalis ‘dumosa’ – small rounded bushy plant 80cm. Thuga occidentalis ‘filiformis’ – Long tread like foliage in a plant that will reach around 2m. Thuga occidentalis ‘teddy’ – Blue green foliage in a tight rounded ball shaped shrub to 60cm. Thuga occidentalis ‘ de Groots spire’ – Slow growing upright form to around 2 – 3 m.
Thuga occidentalis ‘Smaragd’ – Probably the most widely grown conifer, will reach 2.5 m in 10 years, however will eventually grow taller. Easily pruned and grows well in containers. Thuja occidentalis ‘Fastigiata’ – Upright form reaching 3 m in 10 – 15 years.